Galls are abnormal growths on plants. They are caused by the feeding of living organisms, including bacteria, fungi, nematodes, mites and insects, on the affected plants. Although growths may disfigure twigs and foliage, they usually do not affect the health or vigor of the host plant. Horned and gouty oak galls, however, can cause serious injury to oaks. Gall making insects and mites spend most of their life sheltered from insecticide sprays within a ball of plant tissue. Because gall makers spend such a small part of their life outside of galls, it is difficult to properly time pesticide applications. More importantly, gall makers are hard to reach with insecticide on tall trees. However, because galls are so conspicuous, gall makers are easily found by natural enemies. Your best management tool is patience. Most galls will not kill a tree and tend to cycle through times when they are abundant and times when they are rare. Carbaryl (Sevin) is labeled for use on galls caused by mites and adelgids and can be effective, especially against spruce galls. When timed correctly, however, insecticidal soap can be equally effective against this gall. For some galls, however (ash flower gall), insecticide use has been shown to prolong the gall problem. 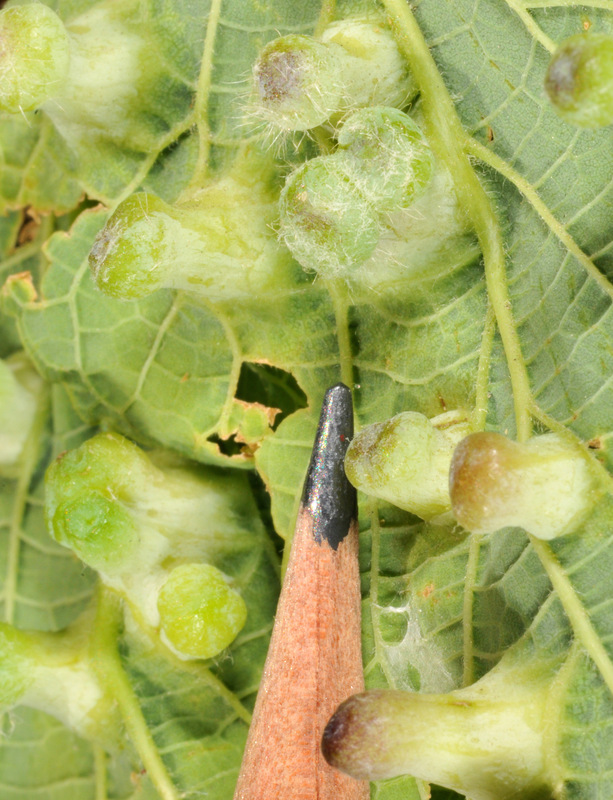 Many gall makers overwinter in bud scales, or bark crevices. As such, most gall problems may be reduced by a dormant application of horticultural oil just before bud break when gall makers become active. Coverage must be thorough since this oil works by smothering and suffocating pests. Be aware that oils can temporarily remove the wax that gives some coniferous plants their blue color. Follow label directions and precautions to avoid injuring sensitive plant species. When removing galls from infested trees it is good to remember that many of their natural enemies live in the galls. Physically removing every last gall from your trees will also remove natural enemies that may keep new infestations to low levels. Leaving a few galls in your area may actually increase the long term stability of your gall management program. This tiny wasp gall maker causes trees to produce large numbers of woody galls up to 2 inches in diameter around the stems of pin and willow oak trees. These galls will girdle and cause significant branch dieback. Female wasps emerge from woody galls in early spring (April) and lay eggs into the swelling leaf buds. Eggs hatch into larvae that cause a blister like gall along the veins. In summer (June) adults fly from leaf galls and lay eggs into twigs. The resulting galls become visible the following spring and finish development in about 3 years. Dogwood borers may also feed in young woody galls. Control. Remove young expanding twig galls as soon as they are visible in the spring. Cutting off old dried galls is not necessary. 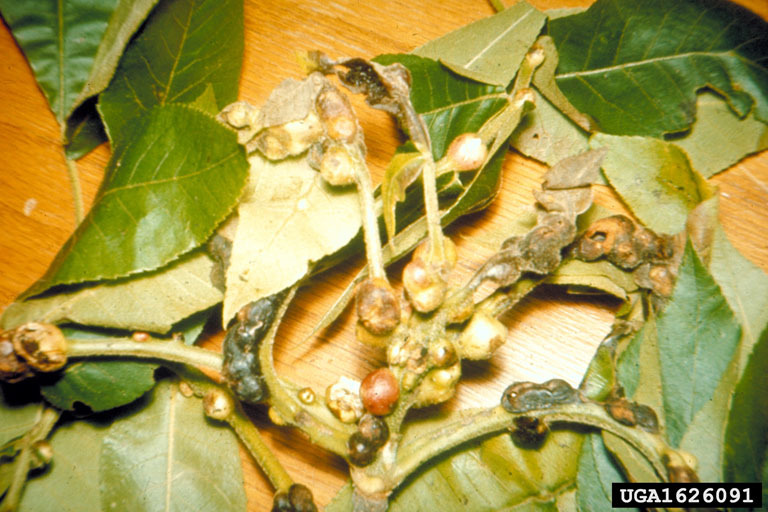 Applications of insecticides can kill leaf galls, but do not reduce the number of new stem galls produced. Green ash is commonly attacked by a small mite that feeds on the male flowers in the spring. This feeding causes the formation of groups of galls surrounded by a fringe of disfigured leaves. Each group of galls dries to an unsightly brown where it remains on trees over the winter. As galls dry, mites migrate to new flower buds. Control. Adult mites are most susceptible to dormant applications of oil when they become active in spring prior to bud break. Galls should be pruned from the plant prior to this period of mite activity in the spring. 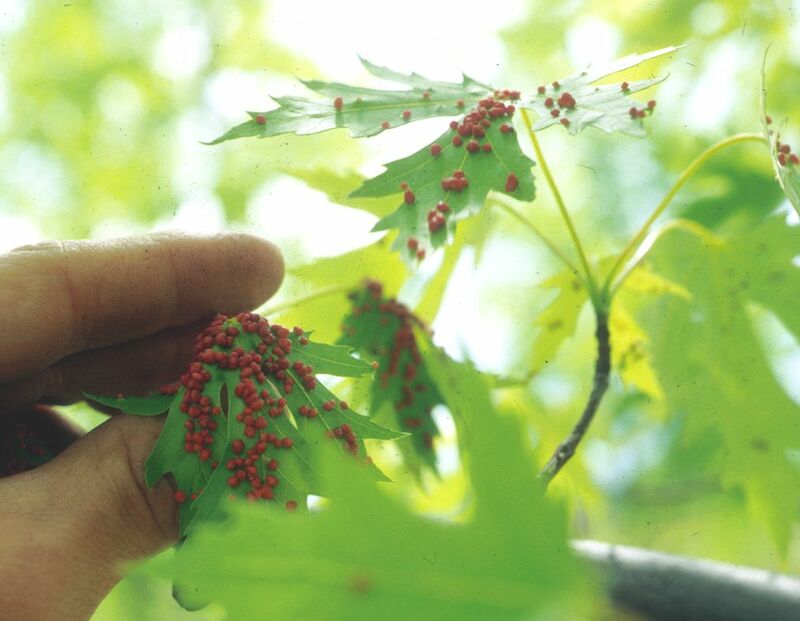 The silver or soft maple tree is often attacked by tiny mites that cause small, wart-like growths on the foliage. These growths are first red, then turn green and finally black. They occur singly or in clusters and may be so abundant that the leaves become crinkled, deformed and drop early. Once formed, the galls cannot be removed from the leaves because they are composed of plant tissue and are actually part of the leaf. 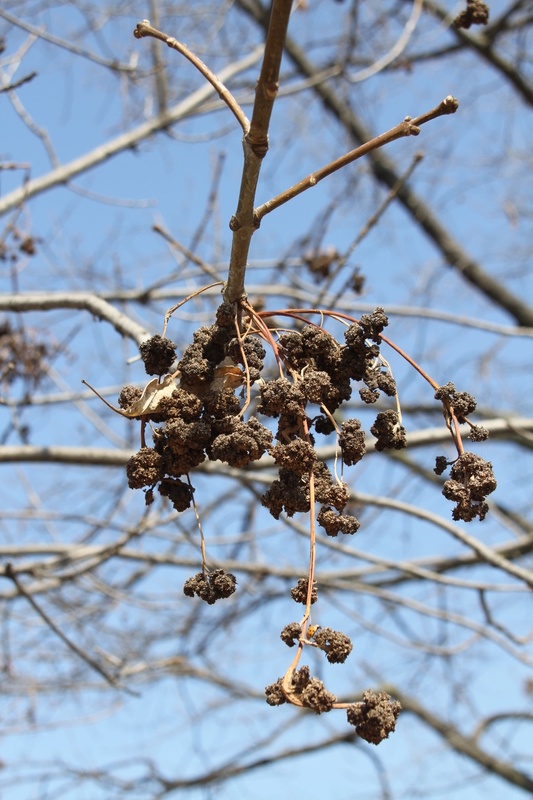 Many homeowners become alarmed when they discover infestations of the maple bladder gall, fearing that their trees might die unless control measures are taken. This is not likely. The galls never cause permanent injury and have little effect on tree health and vigor. The galls do, however, detract from the normal beauty of the foliage. The maple bladder gall mites overwinter in cracks and crevices of the bark. As the buds swell in the early spring, they migrate out on the bud scales. This is when mites are most susceptible to dormant applications of oil spray. When the buds open, the mites feed on the newly developing leaves. In response to this feeding, hollow galls are formed. The mites then live, feed, and mate inside. In fall, mites move back to the bark to hide over the winter. Most of the galls found on the leaves of hackberry are caused by jumping plant lice. In the late summer or fall, the small winged adults leave the galls and fly about seeking places to hibernate. In doing so, they may invade homes and become annoying household pests. Many times, the hackberry trees will have an excessive growth of twigs from central points throughout the tree. Caused by mites or a fungus carried by mites, this “witches broom” condition leads to disfiguration that is easy to see but has little or no effect on tree health. Control. Be sure to remove and destroy old galls before eggs hatch in the spring. Dormant applied oils can help reduce hackberry gall problems. 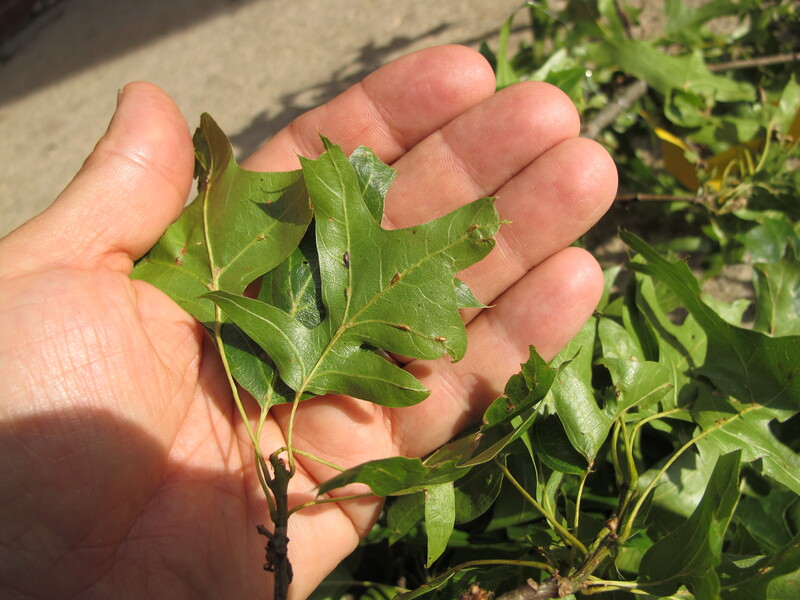 Leave some galled hackberry leaves at the base of the tree to conserve natural enemies of the remaining hackberry leaf gall makers. 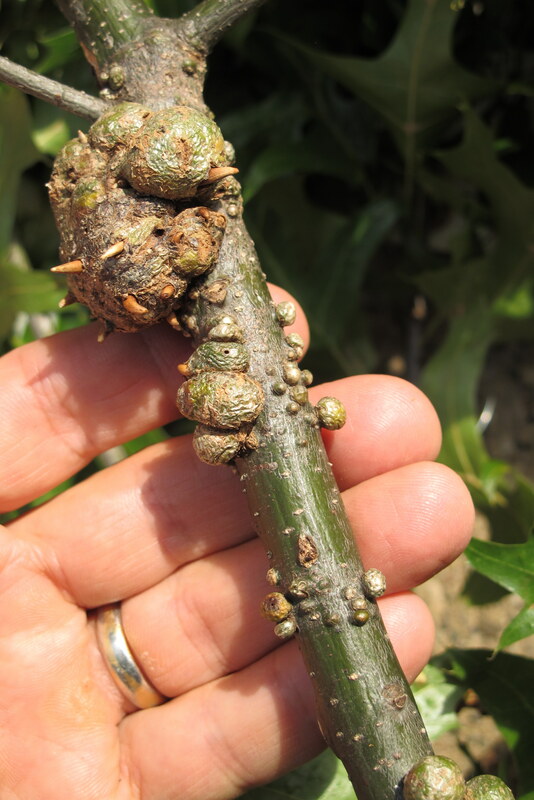 Most hickory galls are caused by the feeding of aphid-like insects known as phylloxera. One such species produces pouch-like growths on the twigs and leaves. Heavily infested foliage may turn yellow-brown and drop from the tree. In early summer, the pouches open and the phylloxera leave to continue their complex life cycle. The insects overwinter in the egg stage often in crevices of the old galls. Control. Be sure to remove and destroy old galls before eggs hatch in the spring. Cooley Spruce Gall. This cone-like gall on the tips of new growth of Colorado blue, Sitka and Engelmann spruces is caused by waxy-tailed, aphid-like insects called adelgids. The gall is green or purplish in color, 1 to 2 inches long, 1/2 to 3/4 inches in diameter and resembles a small pineapple in an early stage of development. In mid-summer, the gall opens to release the aphids that have been developing inside; it then turns brown and looks like a small pine cone. On Douglas-fir this same gall maker will twist and discolor needles in early May. This insect takes two years to complete its life cycle on Douglas-fir and spruce. Winged adults fly from Douglas-fir to spruce in late July. Adults lay eggs on spruce that hatch into nymphs that spend the winter on spruce twigs. Nymphs become active on spruce in early spring just before the buds break. They develop into adults in May that lay eggs on twigs. 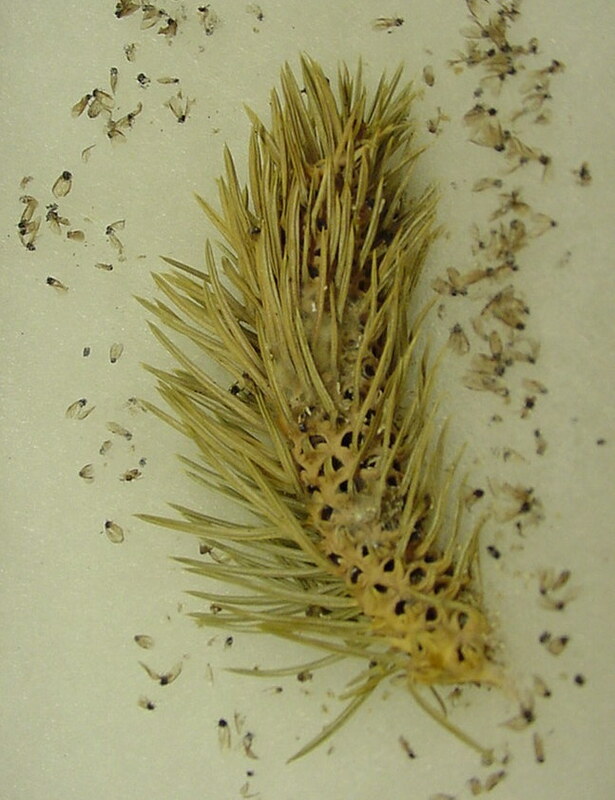 When these eggs hatch, nymphs crawl to the base of spruce needles and cause them to produce the characteristic galls. In mid-summer galls on spruce open to release winged adults that fly to Douglas-fir to lay eggs. These eggs hatch into nymphs that overwinter on Douglas-fir. After bud-break, nymphs become active and start to distort leaves. They develop into wingless adults in May. These adults produce offspring that become winged and wingless adults in July. Wingless adults remain on Douglas-fir and winged adults fly to spruce to complete the cycle. This pineapple-shaped gall at the base of the new growth on Norway, white, black, and red spruce trees is also produced by adelgids. Some individual trees appear to be resistant, while others are completely susceptible. The galls of this adelgid species are 1/2 to 1 inch long. Like Cooley spruce galls, these also open in mid-summer to release the adelgids inside. However, the adelgids remain on the spruce. Greenish, immature females overwinter in cracks and crevices at the base of the buds. In the spring, the Eastern spruce gall adelgids mature and deposit eggs under a mass of cottony threads. These eggs hatch just about when the buds open and the new needles are exposed. In response to adelgid feeding, the bulbous galls are formed containing many cells filled with immature adelgids. Control. 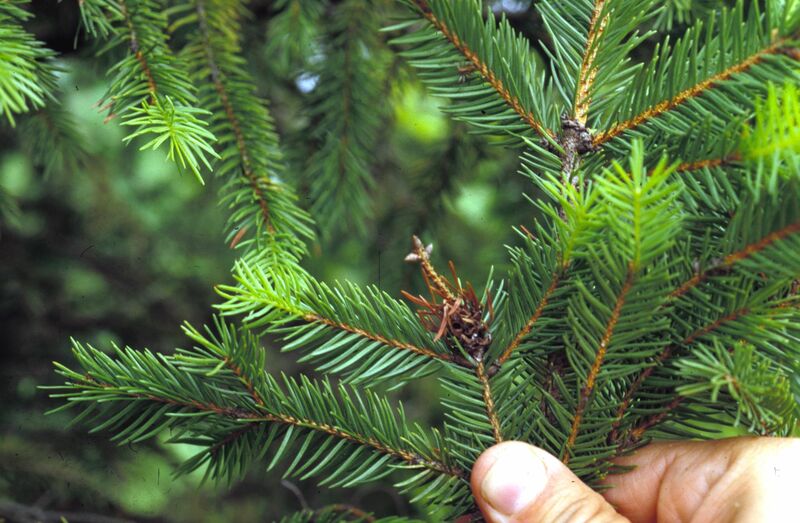 Do not interplant spruce and Douglas fir, since they are alternate hosts of the Cooley spruce gall adelgid. Propagate individual trees that are known to be resistant to aid in long-term control of the Eastern spruce gall adelgid. Pruning out old galls makes areas look nice but does not control the problem. Apply insecticides to kill adelgid immatures in spring. Effective materials include summer rates of horticultural oil, insecticidal soap, carbaryl (Sevin 50WP) or imidacloprid (Merit 75 WSP).